Even the newest of newborns know better than to stick their hands in my stinky pits, but I couldn’t help but laugh out loud when I read this on the “About” page of indie natural deodorant company Colorado PitStik’s website. 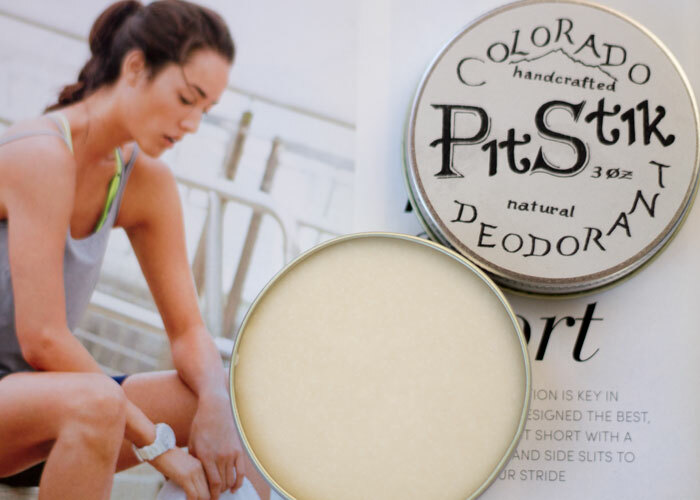 Like many smaller green self-care brands, Colorado PitStik’s founders were inspired to share their handcrafted natural deodorant creations after starting a family and discovering all of the unnecessary and potentially harmful ingredients packed into conventional deodorant. I tried the 3-ounce tins in the original formula, made with just six healthy ingredients, and loved the creamy texture and light tea tree aroma that made blending in my own essential oils for a little extra scent fun (lavender mixes well with melaleuca oil, aka tea tree oil!). But babies definitely should stay away from me and my pits post-yoga. It ain’t pretty, folks. Moisturizing coconut and avocado oils blend well with thickening beeswax for a base so luscious and creamy you’re tempted to massage in more than necessary. But don’t! A little (think dime-sized) goes a long way. Arrowroot, baking soda and tea tree shield you from stink without irritating sensitive underarm skin (I experienced zero redness or bumps with this natural deodorant). There’s nothing else to it, and you’re paying $12.95 for organic and local ingredients; handcrafted quality; and a no-fuss, recycled steel tin that lasts about two months with regular use. I definitely recommend Colorado PitStik for anyone looking for a wonderfully effective natural deodorant and who wants to shop small. With that said, keep in mind that Colorado PitStik is a very small company, and its website reflects that. I’m looking forward to seeing updates to the site’s shopability as the brand grows. It’s a bit tough on the eyes and hard to navigate right now, but we all have to start somewhere! You can find more fantastic natural deodorant recommendations in my ultimate guide to natural deodorants. What other indie beauty brands are you into right now? What natural deodorants work for you? What do you look for when shopping online? Tell me in the comments section!